Former World Superbike and Grand Prix ace Pierfrancesco Chili will be a special guest at this year’s Classic TT, presented by Bennetts, with the Italian attending the festival for three days. The ever-smiling Chili was extremely popular with the UK fans during his impressive career and will no doubt receive a great reception when he visits the island later this month. It promises to be a busy visit as he will be meeting the fans at the Paddock Carnival Chat Show on Friday 26th, attending the RST Legends Dinner on Sunday 28th and putting in an appearance at the Grandstand on Saturday’s opening Classic TT Race day. He will also be heading to the VMCC’s Festival of Jurby on Sunday 28th August where he will complete some demonstration laps on-board his former Suzuki World Superbike GSXR 750, now owned and maintained by Team Classic Suzuki. Now 52, Chili had an illustrious racing career that spanned over 20 years. His first major success came in 1985 when he won the 125cc European Championship. He immediately moved into the 500cc World Championship, spending a year with Suzuki before joining Honda for five years. His best year came in 1989 when, riding the NSR500cc machine, he came sixth overall, also winning that year’s Italian Grand Prix. Between 1991 and 1993, he contested the 250cc World Championship, riding factory Aprilias in 1991 and 1992 and then a works Yamaha in 1993, taking third overall in 1992, which included three race victories. In his eight-year GP career, he won a total of five Grand Prix races and took eleven podiums. 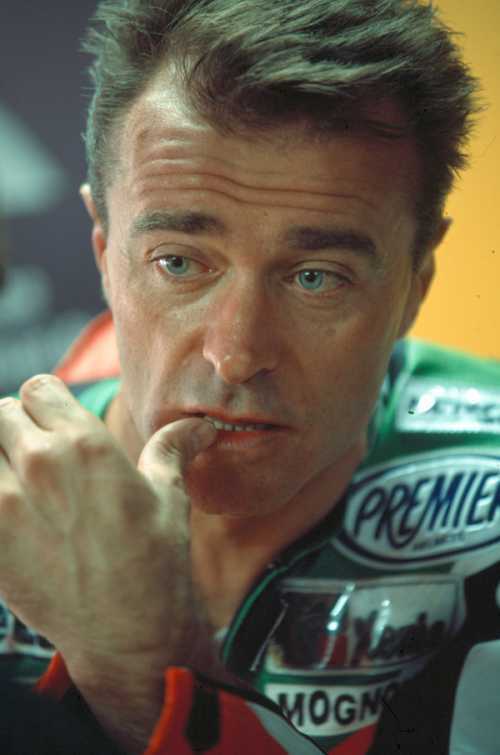 However, it is probably his World Superbike Championship career that established him as such a favourite with the UK fans and, after a brief retirement in 1994, he was an ever present in WSB between 1995 and 2006, riding works Ducati and Suzuki machinery as well as competing for privateer teams. His best years came in 1998 and 2000 when he finished fourth overall for Ducati Corse and Alstare Suzuki respectively. He finished in the top eight of the Championship every year between 1995 and 2004. He claimed a total of 17 wins and 61 podiums in a World Superbike Championship career that took in 278 races before retiring at the end of the 2006 season.